There is nothing like the sight of majestic mountains to lift the spirit toward heavenly things. This 90-day devotional matches reflections, Scripture, and prayers with breathtaking images of God's mountain handiwork! "I lift up my eyes to the mountains ..." Psalm 121:1. About "Devotions From the Mountains"
The mountains can seem like heaven on earth-the peace, the freshness, the grandeur. 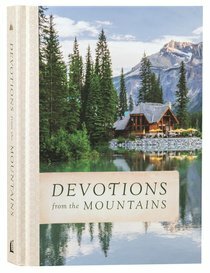 Devotions from the Mountains invites you to spend a quiet moment in reflection each day, finding peace and drawing closer to God-the Creator of heaven and earth. Inside you'll find 90 inspirational readings, Scripture verses, prayers, and breathtaking imagery of God's mountain handiwork sculpted and brought to life by His hand.